Amyotrophic lateral sclerosis is a disease that causes progressive loss of strength and atrophy of muscles, leading to death in about 3 to 5 years. There are cases, however, with longer survival time. Karka 10% of ALS patients can live more than 10 years, and a very small percentage can live for over 20 years if the disease spare the muscles responsible for breathing and the patient is able to receive intensive treatment. The most famous case of longevity with amyotrophic lateral sclerosis is the English physicist Stephen Hawking, who had the disease diagnosed at age 21 and is still alive and productive with over 70 years of age. Unfortunately, cases like his are very rare and do not usually progress of ALS. In this article we will explain what is amyotrophic lateral sclerosis, what are its causes and risk factors, symptoms, how it is diagnosed and what are the existing treatment options to date. To understand what is amyotrophic lateral sclerosis, which, as mentioned above, is also motor neuron disease call, you must first understand how the interaction between nerves and muscles. We will explain below, well summarized and didactic way, this relationship. Any voluntary muscle contraction is carried out thanks to the activation of a group of neurons called the "motor neuron". If you move the feathers, raises his arms, lowers his head or sit solves all these movements were born within your brain, which, through electrical stimulation, did the message reach the muscle groups you want to use. There are 2 types of motor neuron: upper motor neuron, also called first motor neuron and lower motor neuron, known as the second motor neuron. The first is motor neuron in the brain, in an area called the cerebral cortex. For any voluntary contraction of the muscle to move the first neuron emits an electrical impulse that travels through the brain, brain stem passes through and reaches the spinal cord located in the spine. The spinal cord is the second motor neuron, which is stimulated to receive the electrical impulse from the first neuron. The second motor neuron gives rise to peripheral nerves are distributed throughout the body so as to innervate the muscles. The spinal cord occupies the entire central canal of the spinal column, going from the cervical region (neck) until the beginning of the lumbar spine. The body regions are innervated from top to bottom, or the second motor neurons that innervate the upper limbs are located on the cervical spine region, while the second motor neurons that innervate the legs are located lower down the height the first lumbar vertebrae. Note: in the case of cranial nerves that innervate the muscles of the face, such as eyes and mouth, the second motor neuron is the brain stem, a region just below the brain. When a person suffers an accident with serious injury of the spinal cord, it loses exactly that contact between the first motor neuron of the brain and the second motor neuron in the spinal cord. If the spinal cord injury is at the height of the cervical spine, the patient loses the movements from the neck down. If the lesion is lower at the end of the thoracic spine or the lumbar spine, it loses only the movements of the lower limbs. Amyotrophic lateral sclerosis is a rare disease that affects about 0.002% of the population. In Brazil there are about 6000 people with this disease. 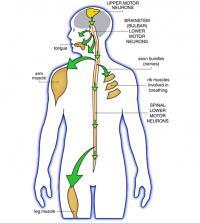 ALS occurs due to motor neuron degeneration first and / or second motor neuron. The patient presents with progressive loss of strength in all muscle groups whose inervadores neurons are undergoing degeneration. ALS only affects the voluntary muscles, i.e. those muscles that are moving only when we want. The muscles of the heart and gut, for example, are involuntary contraction and hence are saved in amyotrophic lateral sclerosis. Breathing despite being held involuntarily in most of the time it is aided by voluntary contraction of muscles, which is why we can hold your breath for a few seconds. Therefore, the paralysis of the respiratory muscles is a common signal in ALS, this being the factor which usually lead to death of the patient. The term "Amyotrophic" means atrophy of muscle, which is one of the consequences of the lack of contraction due to lack of nerve stimulation. Muscle regions affected by the disease suffer atrophy. The term sclerosis comes from the fact the degeneration of neurons lead to their destruction, and these nerve cells replaced by a kind of scar tissue. To complete, the disease is called amyotrophic lateral sclerosis because the second motor neuron usually stay at the lateral aspect of the medulla, suffering sclerosis disease progression. 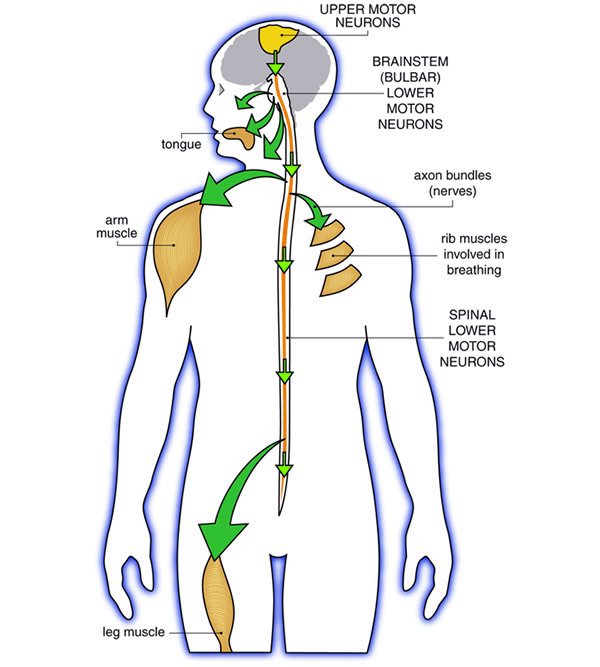 Progressive muscular atrophy - which is the way that only affects the second motor neuron and is about 10% of cases. Progressive bulbar palsy - corresponds to 20% of cases and usually be restricted to the cranial nerves engines. This form affects the first and second motor nerve. Primary lateral sclerosis - is the rarest form, but more benign motor neuron disease. Usually it is restricted to the first motor neuron and has very slow progression. The four forms of motor neuron disease should not be seen as distinct diseases, but show variations of a disease only. The patient may, for example, initially be suggestive of a more progressive bulbar palsy, and stroke then develop typical form of ALS. We do not know why disease occurs in over 90% of cases. Only 5 to 10% there is a clear genetic relationship being transmitted familial ALS. Although the exact causes are unclear, some risk factors are known. ALS is a disease that mainly affects people over 40 years, and its peak incidence around 75 years old. There are cases, however, beginning in adolescence. Men are two times more affected than women. Smoking is a known risk factor. In folding the risk of developing amyotrophic lateral sclerosis, smokers often have a more aggressive disease. The good news is that patients who manage to quit smoking again have the same risk rate of people who never smoked. Continuous exposure to certain substances, especially heavy metals such as lead, also appear to be a risk factor. For reasons not yet clear, professional athletes such as football players, have a higher rate of ALS compared with the general population. It is believed that the intense muscle training can be a trigger for damage to motor nerves in genetically predisposed individuals. As in athletes, amyotrophic lateral sclerosis is also more common in military. The reasons are still unclear. The symptoms of ALS occur by progressive destruction of motor neurons, whether higher or lower. The most common early symptoms are progressive weakness in the hands, difficulty walking, lack of strength in the legs, difficulty speaking or swallowing, cramps or myofasciculations (small movements, rapid and involuntary muscles, which can be noticed through the skin or tongue ). ALS does not usually cause changes in the workings of the heart muscle, blood vessels, bladder or gastrointestinal tract. In advanced stages, however, the patient may go on to have constipation, not by weakness of intestinal muscles, but due to lack of strength in the abdominal muscles, which aids in the expulsion of feces. The touch, hearing, taste and smell also usually be preserved, especially in the early stages of the disease. Sexual function is usually not affected, but as the disease progresses, because of all the complications, the sexual interest of the patient ceases to exist. The most common way of opening the frame is asymmetric weakness that affects only one of the hands or legs. The weakness in the hands usually be noticed by the fact that the patient has difficulty in handling objects, such as, for example, a glass. Difficulty performing tasks that require a finer coordination, such as buttoning a button or put the key in the keyhole, are also common. The weakness in the lower limbs often is characterized by difficulty or feeling that there is something weird time to walk or run. At first, the symptoms of ALS may be subtle, causing the patient delay in seeking medical help. With the progression of the disease, the symptoms started is localized tend to be spread more body muscles. The patient begins to show symptoms of the first and second motor neuron injury, which can be identified through the neurologic examination. For example, muscle rigidity, loss of coordination, and increased reflexes (identified by the famous hammer test knee) are the first signs of motor neuron disease. Have weakness, muscle atrophy, loss of reflexes, the myofasciculations and cramps are symptoms of the second motor neuron injury. Attention, do not be alarmed because cramps and myofasciculations are common findings that can occur in anyone. The language myofasciculations, however, are typical of ALS. In most cases, despite the difficulty of speaking, the intellectual part of the patient remains largely intact. He is fully aware of what is happening and understands the people around you. In about 15% of cases, however, a dementia may develop with the symptoms of ALS engines. In advanced stages of the disease the patient becomes completely paralyzed. The involvement of the breathing muscles can arise early, but it is usually a sign of advanced disease. Respiratory complications end being the main cause of death of patients with amyotrophic lateral sclerosis. No test or examination alone is able to establish the definitive diagnosis of amyotrophic lateral sclerosis. The diagnosis of ALS is based primarily on symptoms and signs observed by neurologic examination. The presence of both the first and second motor neuron signals is very suggestive. Since the symptoms of ALS in the early stages can be similar to many other diseases, the neurologist often request additional tests to rule out differential diagnoses. One of these tests is electromyography, a test that can determine whether the origin of the muscle weakness is the muscle itself or some disease and nerve. The doctor may also order an MRI to capture detailed images of the brain and spinal cord to rule out other causes of neurological diseases such as tumors, stroke, infections, disc hernia, etc. Unfortunately, there is no cure for ALS. The treatment, therefore, aims to slow the progression of the disease, preventing its complications and improve quality of life. Physiotherapy, psychological support, speech therapist and nutrition are essential to atigir these goals. In patients with difficulty breathing, portable fans, called non-invasive positive pressure ventilation can be used to help the patient breathe more effectively. At first, the device can be worn during sleep, and as the disease progresses throughout the day. In patients who now have difficulty feeding because of inability to swallow food, percutaneous gastrostomy is one of the options. This treatment consists of placing a tube through the skin directly into the stomach, becoming this the route of administration of food. The patient's survival time depends largely on the possibility of his having access to all this medical apparatus, including the help of many health professionals. There's only market a single drug approved for the treatment of ALS. Riluzole, sold under the trade name Rilutek is the only drug shown to increase the life span of patients with amyotrophic lateral sclerosis. However, it is not a miracle drug, the gain of survival is small, about 6 months to 1 year, on average.